There’s a lot going on in the financial industry as a whole, but it’s the changes credit card users will be making that’s front and center. No one is really surprised to learn we’ll likely be seeing increases in our credit card APR this year. In fact, it’s been inevitable for quite some time, especially considering all of the new regulations. While it’s not believed the prime rate move far from its near zero percentage, there are other considerations that are driving the increases. Last year, variable rate credit cards averaged 14.5%, but in the first week of January, we saw an average of 14.56% for variable rate cards. Meanwhile, the average fixed rate APR last year was 13.84% and it too is beginning a slow climb and analysts say it should continue well into 2014. In December, the rate had already hit the 14% mark. Of course, we all know how to avoid paying any kind of interest and that comes from paying your balance in full each month. Other tips we always encourage readers to consider include avoiding applying for new credit, avoid cash advances on your credit cards and keep in mind the importance of staying within your credit limit and also avoiding late payments. 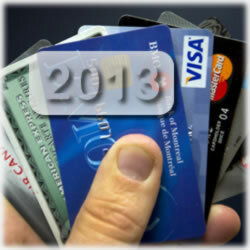 As of this week, you could begin seeing service charges anytime you use your Visa or MasterCard issued credit card. Merchants in many states can now pass on some of their costs associated with accepting your credit cards. Up until a recent court ruling, the credit card giants were able to successfully prohibit their merchants from hitting you with those additional fees; now, though, the surcharges are allowed to fall onto the consumer’s, courtesy of that antitrust suit. It can be a bit confusing understanding these fees, what’s allowed and what’s disallowed. The surcharges, if the merchant opts to pass them on to the consumer, should amount to no more than what the total is. Generally, it should between 1.5% and 3%, but it can’t exceed 4% of the total. Here’s another twist: the type of credit card you use determines how much of a surcharge you’re hit with. Rewards credit cards are typically charged with higher fees. Debit cards can’t be hit with a surcharge. It’s predictable what’s going to happen. We’re at the top of the hill and we’re going to start going down that slippery slope. Also, there are several states that are still barred from charging consumers surcharges. Yet one more wrench in this mix; this time, it’s one put into place by the credit card companies and provides new layer of confusion. Both Visa and MasterCard are requiring retailers to handle credit cards the same way in all of their stores across the country. That means any company that has a store in any of the states listed above won’t be able to pass the surcharges on to any of their customers, regardless of whether or not it’s allowed in a state that merchant does business in. It makes sense, then, that big retailers like Wal Mart and Sears are stating already they won’t be hitting their customers with these surcharges – they can’t. They, along with other big chains, have stores in at least some of those ten states outlined above. And since we’re throwing wrenches into the mix, there’s an American Express stipulation. If a retailer hits a Visa or MasterCard customer with the fee, it must also require AMEX to do so. Problem is, American Express makes definitive rules that prevent that from happening. If a store accepts American Express, it too will be forbidden from hitting the other credit card companies’ customers with the fees. Could it mean that some merchants will drop American Express in order to collect surcharges from the other card networks? It’s possible, but it remains to be seen. The bottom line is that very few retailers would be able to surcharge under the settlement, and that the vast majority don’t want to surcharge even if they could. So why so many merchants insisting they won’t pass those charges on to its customers? First, it’s going to upset some consumers, who just might seek out another place to do their business. More importantly, some of those merchants will find it easier to just increase their prices versus changing its technology to discern who gets charged what kind of fees. This is why many believe the whole shooting match with the surcharges isn’t going to blow into the forefront. Besides, most retailers have long since passed on these surcharges in their pricing. You might think you’ve not, but you can be sure you have. For those companies that do opt for passing on the surcharge, Visa and MasterCard is requiring them to post a notice near the entrance of that business. If you’re an online shopper and if that site is passing the surcharge to you, it will be required to let you know that during checkout. That’s going to be frustrating for some who are determined to not pay a surcharge. If they’ve already filled their virtual shopping cart and then discover during checkout that they’re going to be paying the fee, it could result in a lot of abandoned shopping carts, virtual though they are. In any instance, though, merchants are required to show how much the customer paid on the receipt. Meanwhile, one advocacy group, Consumer Action, is already ahead of the curve and has published a booklet on credit card checkout fees. In it, the organization tells consumers to keep a close eye on their receipts. They should tell those retailers and other companies how they feel. Our advice is to tell them you don’t like the fee and this makes you want to take your business elsewhere. With all of the restrictions and fee dynamics, it’s in any company’s best interest to steer clear of the settlement – and it’s a shame, really. The rulings are moot; ultimately, the merchants saw no solution. Remember, this is a decade-old lawsuit. The shame is found in the fact that so much time was put into a non-starter, especially considering the ultimate solution is no solution at all – for anyone. Dworsky said in an interview last week. There’s no one standing up for consumers and saying that this is really bad. And one final twist: The settlement that allows merchants to impose a surcharge is only preliminary. The court isn’t expected to issue a final ruling until later this year. How’s that for a lack of follow through? Let us know your thoughts on this important new law. Would you abandon a company that’s passing on these surcharges?